Here is this month's sci-fi (slash ultra-modern!) 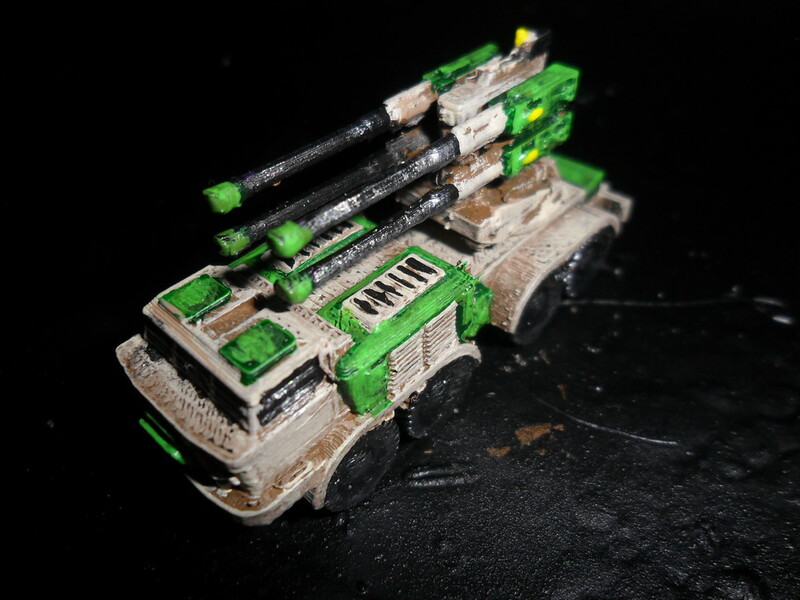 release: the first two vehicles of the Galactic Terrorist army at 144th. (Complemented by this month's regular moderns Technicals!) As the Galactic Terrorists – using low tech for their own time – could quite easily fit in an alternative or near-future modern, I'm cross-linking them to the moderns forums as well. This first two vehicles are the T-132AH "Hyena" (based on the T-72AV) and the ZIL-1135 ASP (Air Superiority Platform) (based on a modified ZIL-135 truck used by the BM-27). For those of you unfamiliar with my sci-fi releases, I always include some fluff with every vehicle as a bit of colour, which you may use, ignore or adapt as you see fit! (You may squarely blame Stewart Cowley's Spacecraft 2000-2100AD for that.) Normally, I would include the general blurb at the start, but for the sake of any interested moderns parties who might not be so interested, I'll leave the GT's fluff description until the end. The T-132 Hyena is a modification of the T-132A main battle tank found in large numbers across the galaxy. The GT have upgraded the engine, replacing the entire engine compartment with a more modern power-plant. The single largest change is the removal of the old gun and the modification of the turret to accommodate the massive 60mm seven-barrel Gatling cannon. This weapon has an enormous rate of fire, and can chew through even heavy armour with a long sustained burst. The cupola pintle machine-gun has been replaced entirely with an automated quad autocannon system for point-defence and anti-infantry operations. Both systems use the GT's own unique technology and are thus more efficient than might be expected, despite being robust. 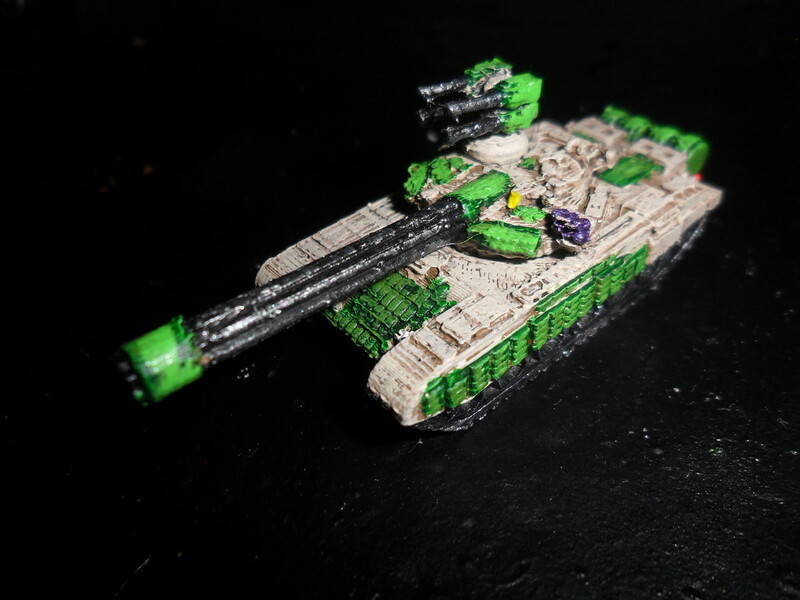 The T-132's armour is outdated, and while the GT have merely added explosive reactive armour blocks to give it some resistance, but it remains fragile compared to most modern main battle tanks. However, it is rarely seen in anything but larger numbers, often a company where one would expect to see a platoon. The Hyena can sustain a withering hail for fire for some time, but this comes at an expense. The GT have stripped out almost all the safety features, and the crew sit cramped uncomfortably, surrounded by volatile GT munitions, In fact, despite the larger power plant, the Hyena is so laden with ammunition, its top speed is little better than the stock T-132. This means that almost any penetrating hit will cause the Hyena's ammunition will cook off and destroying the vehicle in a thunderous explosion. The poorly-trained crew's tendency to forget to drop off the rear fuel tanks during actual combat does not help this problem. The GT's Air Superiority Platform – ASP – is based on the hull of an shortened, eight-wheel version of ZIL-1135 truck. The GT have added additional armour plating internally and an improved engine. The truck carries a set of four rapid-fire 188mm cannons. Like the famous '88 anti-air craft cannons of ancient times, the ASP's quad cannons are equally effective on both flying targets and ground-based armour, and have exceptional range and rate of fire which can be sustained for a remarkably long time. As with the Hyena, the ASP's main flaw is the excess of ammunition stored within it, with volatile propellant and almost no safety features. The relatively light armour does little to protect the ASP from enemy fire. An ASP is rarely seen alone, however, and in numbers, it can overwhelm even main battle tanks with sheer volume of fire before they can all be destroyed. The photos are of the Replicator 2 versions (available direct from us). Next month's sci-fi release will see the next couple of elements of the GT ground force. The Galactic Terrorists, known by several other monikers, including the Galactic Liberation Armada is a large-scale anarchist terrorist and insurgent group. The GT rose to prominence in the early 2320s around twenty years ago, but are believed to have been operational at small scale previously. GT terror attacks rely on mass destruction, typically with explosives and frequent use of suicide tactics. Initially believed to be a conventional terrorist cell, possibly with religious connections, as further intelligence has been brought to light, the GT have instead proven to be a deepening mystery. The origin of the Galactic Terrorists is unknown. There have been many rumours, but all have been eventually disproved. One of the most prevalent and for a time, the leading theory, was they were formed by a long-dead Iraqi man named Jarmin Kuld, who was said to have been influenced by a computer game to create the GT. As innane as that theory sounded, there was enough circumstantial evidence in recovered GT databases that this appeared to be a genuine possibility. It was eventually disproved when no record of this Jarmin Kuld was found after a massive and extensive search of the archival records of the then-Internet, a process which took some years. The GT's ultimate goals beyond destruction of the establishment – any establishment – are unknown. The GT shown no preference in their choice of targets; almost every major and minor power from the Army Of The Red Spear to the Zirakthargûm Divinity have been attacked – and of those that have not, it is more a simple matter of resources than choice. The GT is funded from unknown sources. While over the years, some sources of revenue have been discovered and shut down, these appear only to be supplemental income and only stopped the GT in the local areas. Their armada consists of vessel hulls used by the most prominent Islamic power, who vehemently denies selling their hull designs to the GT. Neither any internal nor external investigations been able to locate the source of these purchases, let alone the star ships themselves. The would-be suppliers have suffered just as heavily from the GT's predations as any other power, lending credence to this claim. It would appear that the GT have their own shipyards in an unknown location, though given the range of their outdated hyper drives it is unclear where they might be found. The star ship hulls are refitted with weapon systems commonly available on the local market, predominantly what appears to be old surplus technology. This comprises mainly lasers, both as point-defence and anti-capital ship systems. The GT only have primitive missiles and torpedoes. To get around the limitations of the former, they almost exclusively use salvo rockets. The GT also make use of space-borne suicide attacks, via means of packing all their shuttles with highly unstable explosives. This tactics is rarely successful – a single hit will usually set off a chain reaction on a group of approaching shuttles – but when it succeeds, it can be devastating. The only piece of technology that is unique to the GT are their point and interdiction kinetic weapons. These systems, predominantly rapid-fire gatlings or cannon clusters are considerably better than almost all human powers, being on a par with the more advanced races – despite their outward appearance of crudity, these systems are remarkable durable. This translates into their ground combat armament – few missiles, but a large number of rapid-fire kinetic weapons. The GT is comprised exclusively of humans. An estimated 75% of the GT personnel appear to be of Arabic extraction, but the GT show no preferences to ethnicity or nationality when attempting to radicalise and recruit new members – thought they do have a much higher rate of recruitment of men, when women are seen in the ranks, they seem to be of the same status. The GT seem to use a mixture of English and Modern Standard Arabic as their languages of choice, oddly reserving the latter for internal communications and using the former for all outward communications (even if addressing Arabic speakers). Despite frequently addressing their enemies as "infidel" and "heretic", the GT ascribe to no known religion, sect or cult. In fact, the GT seem to find religion offencive and actively target religious institutions are part of their normal operations and frequently and decisively as they attack military or corporate targets. Given the ethnicity of the GT, an early suggestion that they were radicalised Muslims was quickly quashed with a wave of terror attacks on mosques throughout human space, targeted for maximum casualties – apparently in reprisal. A later implication made by one pundit on the galactic new network was that the GT were some sort of radical atheist organisation. That notion, too, was disproved as within the week, a series of attacks were targeted at both the pundit and highly-visible atheists. The GT also seem to hate magic with the same passion and in at least two recorded instances, actually targeted demonic cults – though this was only discovered in the aftermath of the attacks what their victims had been doing. Gathering intelligence on the GT has been extremely hard. Firstly, just obtaining GT prisoners is markedly difficult, given the GT's penchant for suicide. Even outside the core of fanatics, the generally poorly-lead rank-and-file prefer death to capture; even when their morale is broken – there have been numerous instances of routing GT troops simply running off cliffs like proverbial lemmings. This is problem is exacerbated due to the compartmentalised structure of the terror cells. No ranking member of the GT has ever been captured and the upper echelons remain a mystery. What few prisoners have been taken show considerable resistance to interrogation (even, the Herosine Empire reported, to torture) and so far no prisoners have been able to be successfully deprogrammed. All undercover agents that have been sent to try and gain information on the inside have either been uncovered and killed, forced to exfiltrate or, in some unfortunate cases, have defected to the GT entirely. In 2340, the UNSC formed a task force to deal with the GT problem. Any and all races targeted by the GT, regardless of allegiance, were granted access, using the same protocols as the Cybertank and Rift Collective threats. With contributions from several major nonhuman powers – even the Army Of The Red Spear made some limited input – successes have been gleaned. The greatest information came from the infiltration of a previously-unknown training camp, the largest yet discovered. This operation got further than any previously, and due to the extra resources, the task force managed to extract the agents alive. What they revealed is an increasingly alarming picture. It has been verified that the GT are subject to some unknown form of brainwashing beyond their highly effective methods of radicalisation and indoctrination. The indoctrination methods had a near-100% success rate (the exflitrated agents being the only exceptions). The agents reported that, after the final phase of the indoctrination – a process they were not witness to, but involved the recruits leaving the training camp – when the recruits returned, there were some notable shifts in personality. Any doubts about the nebulous "cause" were gone. More disconcertingly, the indoctrinated returned apparently fluent in Arabic and speaking with an Arabic-sounding accent which appeared to have replaced any previous accent the speaker had. One agent was a language specialist, inserted to see if they could isolate any particular dialects which might give a clue to the GT's ultimate base of operations found he could not specifically place this accent at all. They also had a marked tendency to use repeated phrases, especially when excited or surprised. Most concerningly of all, the agents, through conversation and investigation, managed to accrue the places of origin of almost all the recruits. Almost 60% of the recruits training claimed to be from places that did not exist. These places were all purportedly located on known planets, often fictitious towns and villages. Some of these were located in areas of known wilderness, but other purportedly were in the same location as existing, different settlements. Despite exhaustive questioning on their hometowns, none of the agents were able to detect any suggestions that the recruits in question were lying or making up, nor or any lack of detail or repeated details that might suggest fabricated memories. Attempting to use maps to disprove the recruits statements was denounced as infidel misinformation and a dramatic rise in hostility and the agents abandoned that line of enquiry quickly. Following the inevitable battle on exfiltration, the bodies were examined. These mysterious men were not clones or replicants, and no trace of genetic, psionic or magical tampering could be found. Nor was any residual evidence found on the fresh recruits, meaning the methods used in the final brainwashing are equally as mysterious. There is clearly some deeply disturbing secret behind the GT, and what, who, where it is and what it or they intend is a frightening enigma.